Which Office 365 are you getting? Do you already have Office 365? Which one? There are new computers sold with ‘free’ Office 365, what does that mean and how does it work? It’s not as simple or as good a deal as it seems. You’d hope this offer was easily given to customers, but no. It’s made complicated, presumably to reduce the number of people who take the offer and instead buy Office 365 again. Let’s start with the obvious. It’s not a ‘free’ Office 365. You’re paying for it as part of the overall cost of the computer. The deal would only be truly free if you could buy the same computer, without Office 365 and get an equivalent reduction in price. Usually the Office 365 offer is ‘baked in’ to the supplied computer. You must buy the computer with Office 365 so it’s not free. The ‘free’ Office 365 is really a lure to encourage the computer purchase and get people onto to Office 365 annual payment system. It’s the same with many bonuses with new computers, like anti-virus or security software. Make sure it’s clear which ‘Office 365’ you are getting with the computer. Office 365 Personal – the single user plan, retails for US$69.99 this is the most common ‘free’ plan offered with a new computer. Office 365 Home – the more popular plan which can be used by six people. Retails for US$99.99 it’s the most commonly purchased plan but is rarely (if ever) offered as a ‘free’ bonus with a new computer. Either way, the plan can be used on more computers than just the new device. Office 365 Personal or Home applies to people, not computers. 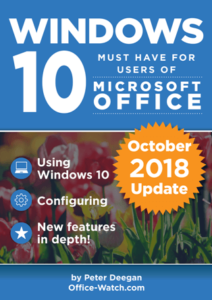 Each person linked to an Office 365 plan can use Office for Windows/Mac on up to 5 computers/devices. Sometimes it’s just a trial version of Office 365. Sometimes the ‘Office 365’ with the computer is just a one-month trial of Office 365. Big deal, anyone can get a one-month trial of Office 365 from Microsoft. An ‘amoeba on Saturn’ could get a one-month Office 365 trial. If you already have Office 365 then the ‘free’ Office 365 might extend your current plan or it may be wasted. If you already have an Office 365 plan of the same type as offered with the new computer. Usually that means you have Office 365 Personal and the ‘free’ Office 365 is also a Personal plan. The bonus Office 365 Personal plan will extend your existing Office 365 Personal plan by another year IF you use the same Microsoft account/email address for both. A more common situation is having Office 365 Home plan and getting Office 365 Personal with a new computer. These are different products which can’t be merged or extended. A Microsoft Account can only have one active Office 365 plan at any time. It’s not clear what happens if you try adding Office 365 Personal to an existing Home plan (or vice-versa for that matter). It might depend on whether your the primary owner of Office 365 Home or merely linked as family to someone else’s plan. Lacking any clarity, mixing Office 365 plans is a situation best avoided. If you have Office 365 Home already, don’t get (or at least activate) a Office 365 Personal offer. Once you’ve bought, there are tricks to make it hard to redeem the offer. The hope is that you’ll forget or be so frustrated with the hassles that you’ll buy Office 365 separately and not get the Office 365 you paid for. It’s nothing new. Those ‘cash back’ offers (common in North America) are designed to be difficult to redeem. Any small variation from the exact requirements is enough to have your claim rejected. According to Microsoft there’s a box which appears. They make it look simple but there’s some traps. Make sure the email address used to activate Office is the one you want. It’s usually your main or primary email address. The one linked to your Microsoft account. If you have an existing Office 365 plan, use that email address/Microsoft account. The choice of email address is important because the link between the ‘bonus’ Office 365 plan and that address can’t be changed. The address is linked to the Office plan you get and login to Office software. Reminder: Office 365 software (Windows or Mac) can only be fully used with a Microsoft account login. The same login has your OneDrive 1TB and Skype minutes. Many people have multiple email address and it’s to easy to select the wrong one. Choosing the correct email address is very important, especially for Office 365 Personal. Office 365 Personal is the most common ‘bonus’ package offered with a new computer. Note the deadline carefully. You have only 180 days to redeem the Office bonus. With a little trickery by you, it’s possible to extend an Office 365 plan beyond the official 12 months.